Dishwashers are a boon to any kitchen. But things can go wrong, even with units made by premier manufacturers like Asko. BUT, before you pick up your telephone and send out a service SOS, C&W recommends you do some of your own troubleshooting. What sometimes seem to be major problems actually require very simple fixes. Unless the water going into the dishwasher is already hot, your machine needs to warm it up. This can extend the cycle, even in top brand machines. Turn on the kitchen faucet before you run a load of dishes and let the water heat up. Then turn on your machine, which should run through its cycle more quickly. Ecological concerns have forced detergent manufacturers to cease using phosphates, which used to be the main cleaning agents. Now, both liquid and powder detergents use other, more environmentally friendly chemicals. However, some of these new liquid detergents can sometimes cause rust with long-term use. And the chemicals in powder detergents can lose effectiveness when left open to the air for a period of time. C&W recommends that dishwasher owners use special cleaning tablets like those made by Finish. Not only do they clean kitchenware, they also work on calcium deposits that cause white streaks on glasses. If the problem is not with the type of cleaning agent used, you may want to rinse out the filters at the bottom of the washing machine. Manufacturers recommend this be done at least once a year: we suggest you do it more often. You may also want to check the spray arms in your machine. Food sometimes gets inside them and blocks the little holes. Like the filters, the arms are removable. Once you have them out, simply rinse them off, take out any food particles you see and put them back into the machine. Check your owner’s manual for more details. When you load your dish and glassware, don’t overload. Crowding a machine full of dishes and glasses can cause the water to miss surfaces that need cleaning. It may also block the detergent dispenser so that it doesn’t function properly. To ensure proper cleaning action, leave space between all items. This tends to happen when you pre-wash dishes before loading the unit. The chemicals in the detergent don’t have any food to act upon, so they begin eating away at the surfaces of the dishes and glasses, especially those made of crystal. Rinsing off larger particles of food before loading your machine, however, will not cause this kind of problem. Newer model dishwashers are made to use less electricity and don’t have high wattage heaters to dry dishware. To help compensate for this, we recommend that you use a rinse aide like Lemishine. You can also use this product, or even a glass full of vinegar, to clean out calcium deposits that may build up on the inside of dishwasher water tanks. If you use a rinse aide, watch out for how much you use. Too much can cause foaming. You can find a dial that allows you to adjust rinse aide amounts. We recommend that you start at the lowest level and dial up as needed. If you see standing water in your dishwasher, you need to check the both the filters and the air gap between the dishwasher and the sink. It’s very easy for a seed or other small food particle to get caught in the air gap. This blocks water and keeps it from draining out which causes it to collect on the bottom of the dishwasher. To see if the pooling is caused by a blockage, pull off the silver cap that sits next to your faucet and pull out the white plastic insert you see. Check for seeds or food inside the air gap, and reassemble. 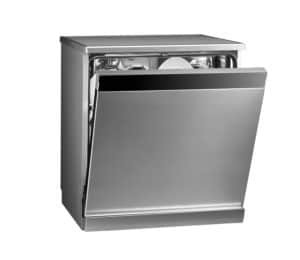 If you hear the machine running even after your dishwasher has completed its cleaning cycle, it’s possible that your unit may have a water valve problem. Asko units in particular have a sensor at the bottom of the dishwasher. When water leaks, an Asko dishwasher turns on the drain pump to compensate for a malfunctioning water valve or excessive foam production. If this seems to be the case, (1) do not turn off the power and (2) call for service. This can happen when the dishwasher is not draining correctly or when the water temperature is not high enough. Food deposits can congeal around the base of the machine or in the gasket around the bottom of the door. Cleaning out this area will help eliminate the problem. Look in your disposal and make sure there is no food blocking the drain. Also check to see that water is flowing out of the machine. If not, call for service. The C&W Appliance Service team offers repair for both premier and major dishwasher brands. Our skilled, professional technicians are here to ensure that your appliances receive the care they deserve. When you want repairs done right the first time, contact us today!